Gov. Pat Quinn signed the executive order in the William W. Powers Visitor Center, a new building in the Calumet area's Millennium Reserve. 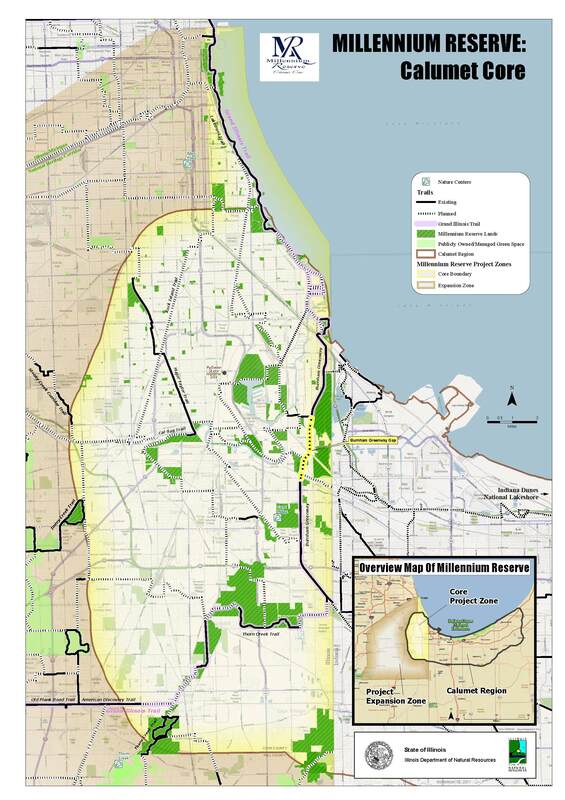 Once an interwoven swath of wetlands and oak savannas, the Calumet region is home to Chicago’s largest concentration of industrial jobs, as well as some of its most threatened wildlife and natural areas. In the first major development since the nation’s largest open space project was announced in 2011, federal and state agencies Friday committed $6.8 million to fund environmental restoration and recreation programs through the Millennium Reserve Initiative. Brownfield remediation, public recreation industries, intermodal freight shipping, and a developing network of trails are among the specific projects outlined in the executive order. 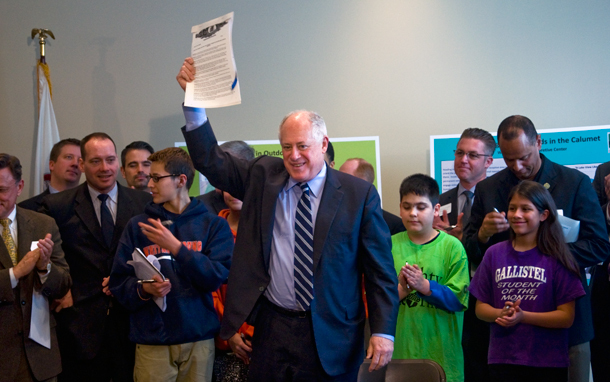 Quinn’s message tied environmental protection to economic development. “Doing things right by our environment, having a conservation ethic is very important for jobs,” Quinn said. Citing a figure from the Department of the Interior, he said wildlife-related recreation generated $145 billion in 2011. “We want people to come from far and wide to enjoy everything we’ve got in Millennium Reserve,” he said. The Calumet region’s conflicted environmental history, however, demonstrates the difficulty of balancing conservation principles with the pressures of development in practice. As for the composition of the steering committee, appointees were from the region’s main landholders — the Park District, the Metropolitan Wastewater Reclamation District and the Forest Preserve District — as well as government agencies and conservation groups. Although she applauded the initiative’s mission, Peggy Salazar of the Southeast Environmental Task Force said the steering committee could use more community members. “We hear lots of announcements,” she said. Years before the Millennium Reserve Initiative was announced, she noted, community groups developed their own vision plans for the area. Salazar’s own group hopes to develop a “green industrial corridor” with light manufacturing that uses renewable energy, to complement the “green natural corridor” of nature preserves. The committee will report to the Governor every six months, beginning after their first meeting. Rogner said the group plans to meet before the end of March. Meetings will be open to public input, Quinn said.